I’ve been obsessed with my slow cooker since the baby arrived because it has saved my life so many times. A quick 10 minutes of prep and dinner is ready in a few hours. That means I could make dinner, clean the kitchen, put in a load of laundry and take a quick shower all within a 30 minutes nap time. I’ve had zero time for elaborate dinners and since he was born our dinners have all been quick and easy like these shredded bbq chicken nachos! 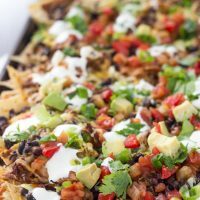 Every new parent or busy adult needs these nachos and why I am sharing it today as we celebrate a dear friend and blogger in a surprise virtual baby shower. Surprise David!! I first made pulled BBQ chicken in the slow cooker a few weeks ago and we’ve been obsessed. Served in a salad, on a bun or just munched on, it’s a great dinner. I used leftovers of my second batch of that recipe to make this shredded BBQ chicken nachos. The nachos is topped with whatever you have on hand and it’s simply amazing. If you are making your own shredded chicken, place the chicken breasts in your slow cooker. In a small bowl, whisk together the bbq sauce, worcestershire sauce, vinegar and salt and pepper. Pour sauce mixture over chicken. Cook on high for 3-4 hours. Once chicken is cooked through, remove the breasts and shred into pieces (I usually use a stand mixer for this, just beat the chicken with the paddle attachment OR you can use a fork as well.). Return chicken to slow-cooker and toss with bbq sauce mixture. Heat oven to 350°. Spray one large baking sheet with nonstick spray to coat. Arrange one bag of the chips on the prepared sheet and top with half of the bbq shredded chicken, black beans, onions, jalapeños and cheese. Top with another layer of chips and repeat the toppings. Bake the nachos until the cheese is melted, about 20-25 minutes. Sprinkle with fresh cilantro and your choice of toppings (avocado, pico de gallo, salsa, sour cream). Serve immediately. Congratulations David!! I wish you guys a speedy and easy delivery. Enjoy the little man. And hang in there… those first few rough weeks will come to an end. Here’s everyone celebrating David today! 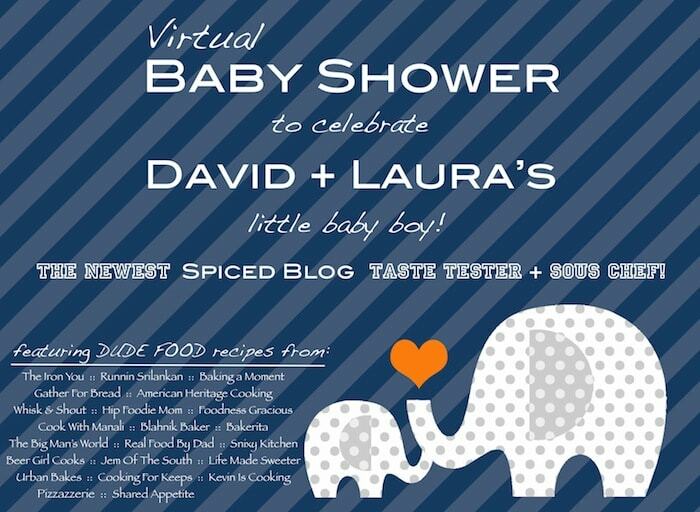 There are LOTS of “Dude Food” ideas that’s making this manly baby shower very delicious! Thank you Chris for getting us all together to celebrate David! Yes!! I love that recipe dude!! This is the sweetest! 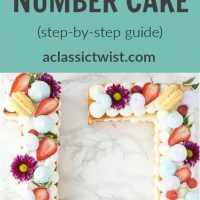 David is such a great guy and has such a great blog! This is so awesome of you all! Slow cookers are such a life saver! And BBQ Nachos are practically my favorite food ever. 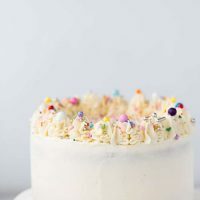 Love the thick layer of toppings! They really are life saves! Thanks Christin! You’ve making me hungry – and I just had breakfast – though yogurt doesn’t compare to these loaded up nachos! Hhahah yeah yogurt got nothing on these lol! BBQ chicken! These nachos look so good! It’s only 10am here and I already want nachos! 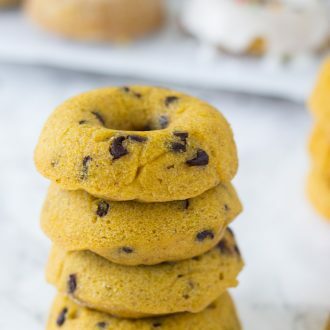 So delicious 🙂 Great recipe!! The best thing about being an adult is being able to turn nachos into a completely acceptable dinner. This is what I want tonight! Looks amazing! The slow cooker is totally a life saver – especially with a new baby! 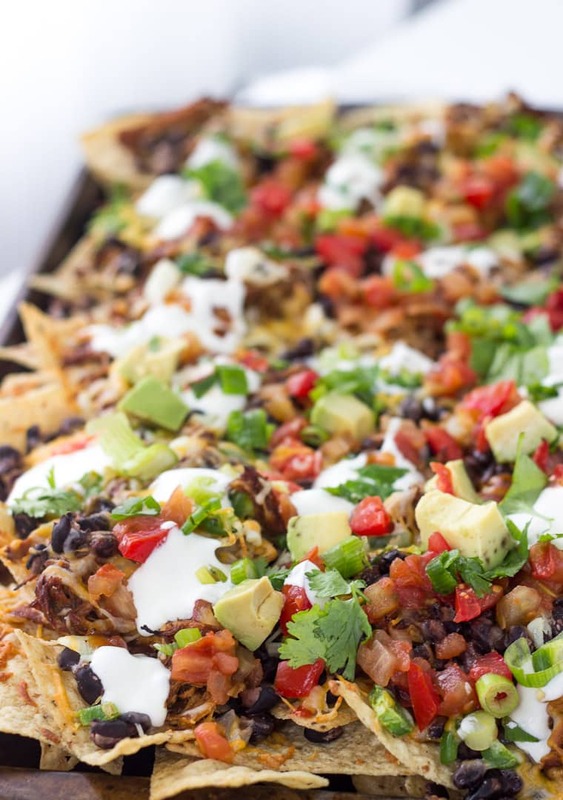 These nachos look so good and now I’m craving them for lunch! I’m deciding to buy a slow cooker for a while now, still not there though. 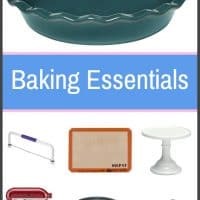 Not so much because of it’s practicality, but because of all delicious recipes out there. This one being one of them! You need to just make the plunge as it is worth it!! You know I love when you do savory dishes. 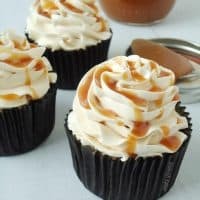 These look amazing and I love my slow cooker!! Such great advice for David!! I don’t have a baby on the way but I certainly intend to be making this slow cooker pulled chicken this tomorrow! I know this sounds crazy but I work nights in a restaurant and so I’ve been putting my slow cooker on before I go to bed and then lunch/dinner is all ready for me when I wake up! All I have to do is pack it up! I literally can’t stop thinking about these nachos! Ever since I saw them this morning, my brain has been tuned in straight to nachos. 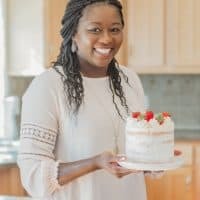 Thank you so much for this post and all of the advice, Zainab! We’re excited (and pretty nervous)…but more than anything, I think we’re just ready. Enough of the waiting already, little man…let’s get this show on the road! I can absolutely see these nachos being an awesome dinner for something quick when we have our hands full with diapers, burp cloths and of course a son in there, too. Thank you again for being awesome! So glad you love this!! And I hope you try it 🙂 Hhaha I remember wishing he was here already…that last month is the longest. But in retrospect, I wish he was in there longer and I slept more before he came lol. But he will be here before you know it so enjoy these last few moments as a couple. Wow Zainab! Your photos are amazing! I seriously feel like I could dive right in to all that cheesy nacho goodness! I want these for dinner!! 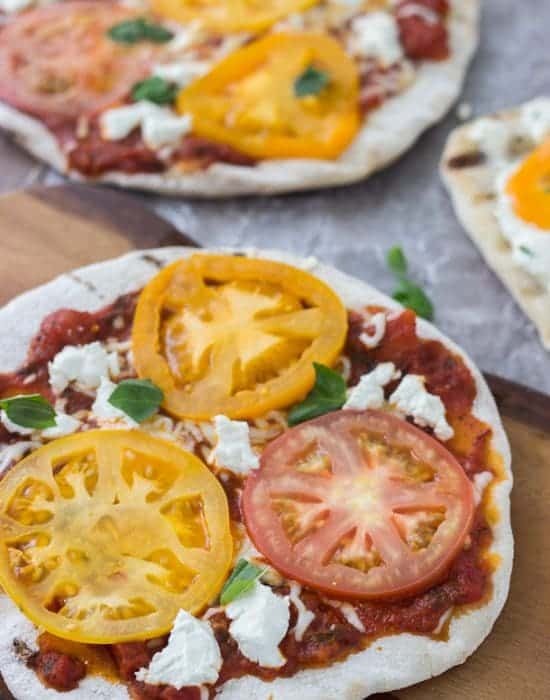 These look like the perfect quick and easy dinner. 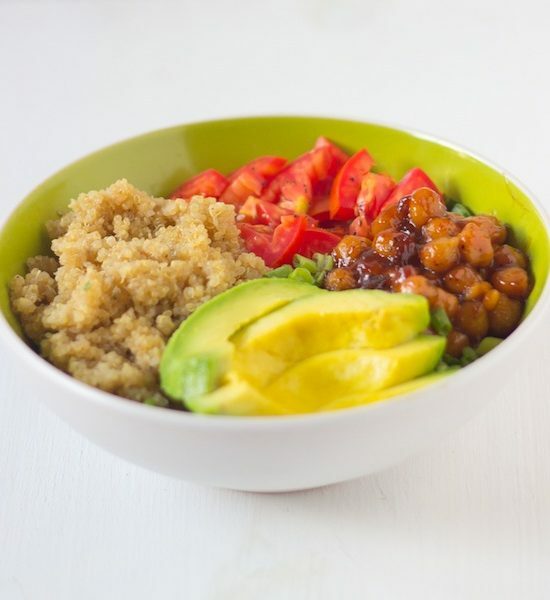 I just got a slow cooker too and I’m loving quick meals like this! So glad you are loving your slow cooker too! Let’s make a movement?? 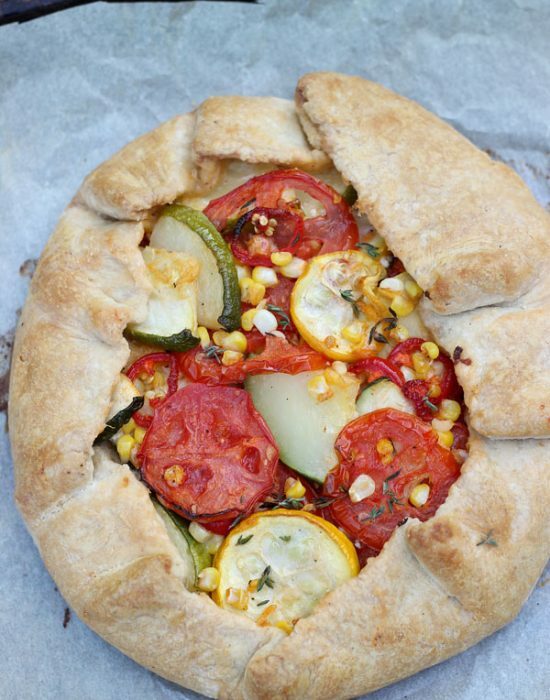 David is a fun & smart guy..I love seeing his recipes on his blog. 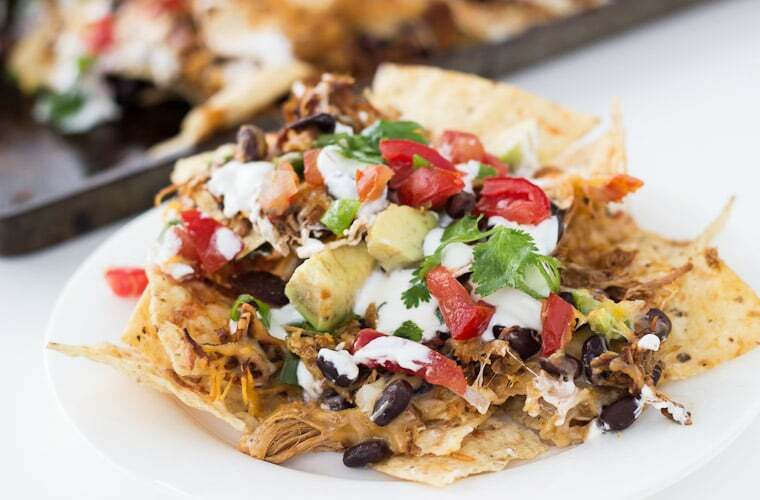 And this shredded bbq chicken nachos is perfect for dude food….don’t you love cooking with slow cooker? He always has great recipes…and stories! Love his blog! I’m obsessed for real with my slow cooker now. I haven’t made a meal on the stove in so long lol! Slow cooking my meat for BBQ is pretty much the only way I do it. And after living in Memphis where they put BBQ on everything I fell in love with BBQ nachos. Love these! They really are everything nachos!! Is it wrong to want nachos for breakfast? Because I am totally craving this bbq chicken version. Hahha it is not wrong!! Especially if they were leftovers from the night before. I don’t even remember those days 🙂 Love any and all slow cooker meals. These look wonderful. Haha right? Such a good thing that we forget. You do “dude food” so well! 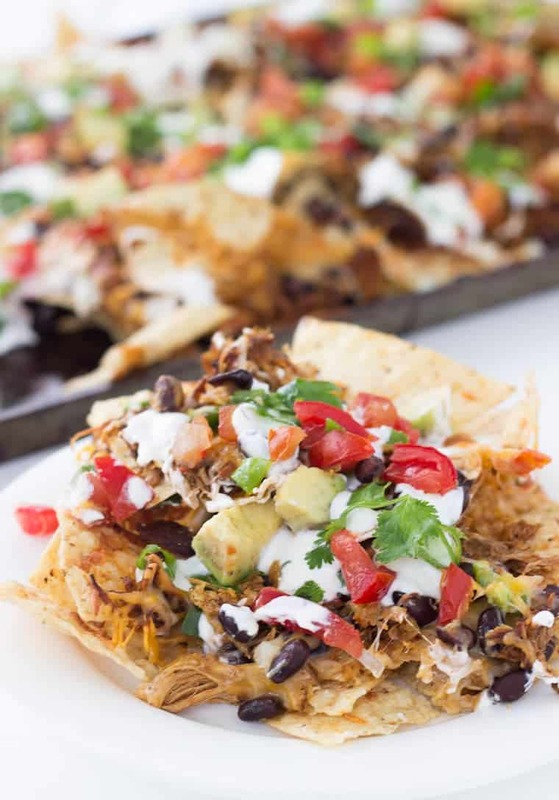 These nachos look incredible, and I love that you used your slow cooker to make the chicken! Congrats to David! 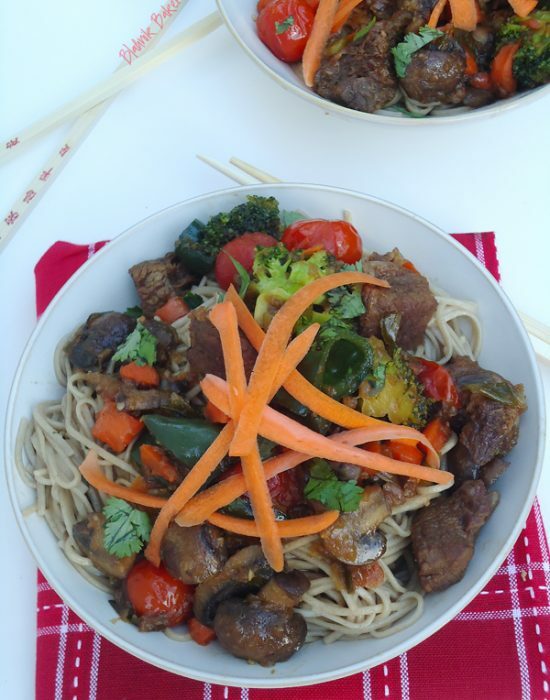 I am a huge fan of using a slow cooker so I really love this recipe. I also love recipes that can be used in multiple meals like this BBQ chicken on these nachos, on salad and more. Love it! Whoa! 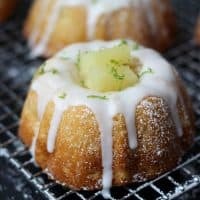 These sound amazing!! I only recently bought a slow cooker, and am obsessed! 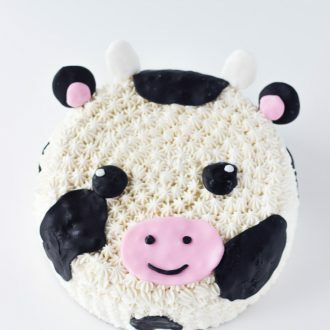 Will be making this soon! Ohhhh man, these nachos are SO legit Zainab! LOVE them and I would totally eat the whole batch all by myself haha! I’m a bit of a nacho lover, errr, addict!! Thanks SO much for bringing such an awesome recipe to the party! Thanks Zainab for such a delicious recipe. It is life-saving.